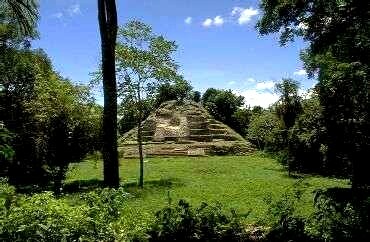 Custom Jungle and Archaeology Excursions to Belize! Radisson Fort George Photo Gallery Coming Soon! 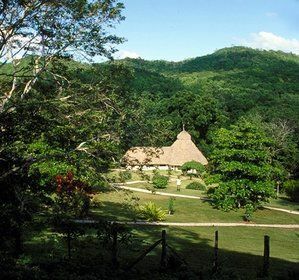 Caves Branch Jungle Lodge is located in the Belmopan area on a the privately owned 58,000 acre Caves Branch Estate, beneath a 100 foot rainforest canopy, alongside the turquoise waters of the Caves Branch River. Discover the beauty and excitement found in the tropical jungle and the caves of Belize. 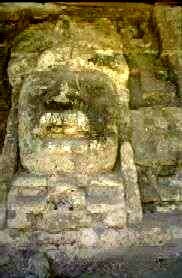 Encounter indigenous animals and plant life and the many relics of Belize's ancient Mayan past. After 12 years of exploration deep into the jungle and ancient Mayan caves of Belize, Caves Branch now shares these discoveries with you. 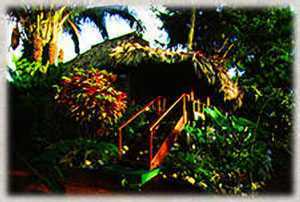 All of the accommodations are completely screened to give you a comfortable and bug free environment but wide open to the symphony of nature. With torches burning throughout the night, casting a glow across the jungle, the babbling river and the cacophony of night creatures, you settle in for a good nights sleep but are roused early to the sounds of the jungle coming to life. 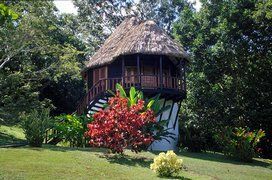 Chaa Creek Cottages in the Cayo District. Located in the San Ignacio (or "Cayo") District, Chaa Creek's extensive trail system has been developed to allow exploration of the 330-acre property either on foot, horseback, touring van, or canoe. The Cayo District, 78 miles east of Belize City, is perhaps the most lush and scenic area of Belize. 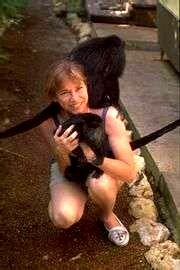 There are mountains, caves, jungles, deep river gorges, waterfalls, Mayan ruins, and plenty of wildlife. Note: All of the programs are scheduled for an 8:30 AM pick-up at the Belize Municipal airport, or 9:00 AM at your Belize City hotel. The return transfer is scheduled for a 4:30 PM drop off at the airport or Belize City hotel. Discover the allure of Lamanai Outpost Lodge, (right) scenically situated in the "Orange Walk" District on the New River Lagoon, adjacent to the Lamanai Archaeological Reserve, located about 130 miles northeast of Belize City. Visualize waking to a complex chorus of jungle sounds on a medicine trail. 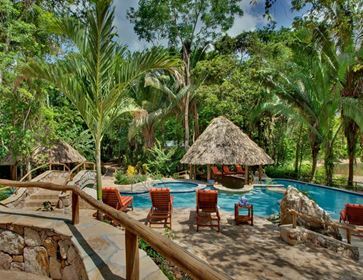 Next, explore the nearby Mayan ruins, take a morning walk or horseback ride, observe delicate orchids, brilliant tropical birds, the Howler and Spider monkeys, and the unsurpassed natural beauty of Lamanai Outpost Lodge.  Unlimited Coffee Bar and Bar for local liquors and beverages.  Imported liquors and wine are extra. 9% Belizean Government tax not included. Rates do not apply Christmas/New Years or Easter. Nine activities are offered on a daily basis as part of the Natural History Package (two per night stayed included in all packages). we provide a road/river transfer IN to the lodge (2 hours from Belize International or 2.5 hours from Belize City hotel or Belize Municipal) and light aircraft OUT to Belize International on departure day. We can provide charter flights to other airstrips within Belize for an add-on charge.  Scheduled transfers cycle between the lodge and the Belize Internation Airport - 60 minutes by road and 60 minutes by jungle riverboat.  Transfers depart the lodge & airport at around 7:30 a.m., 1:00 p.m. & 4:00 p.m. daily - Get the exact times during the booking process. Note: Rates are subject to change if charter rates are increased by supplier airlines. Other rates subject to change without notice.